A few days ago I wrote about the Bulgaria sinking on the Volga. Some are comparing thesinking to Titanic but the International Business Times disputes the comparison. For instance Titanic was a state of the art ship when it launched in 1912, but the Bulgaria (launched 1955) was far from that. It had few inspections over the last thirty years, is alleged to have been poorly maintained, and had outdated equipment. According to reports, the Bulgaria hadn’t been seriously serviced since 1980, and one of the its engines was under-powered before the 56-year-old vessel set sail. When wind and choppy waters turned the boat sideways — a dangerous position for any boat to be in — the captain was unable to right the ship before it tipped. But on one issue the IBT agrees it is like Titanic: both events were devastating and avoidable. Wikipedia has information about Bulgaria. Photo from http://belyaefff.livejournal.com and posted on Wikipedia. 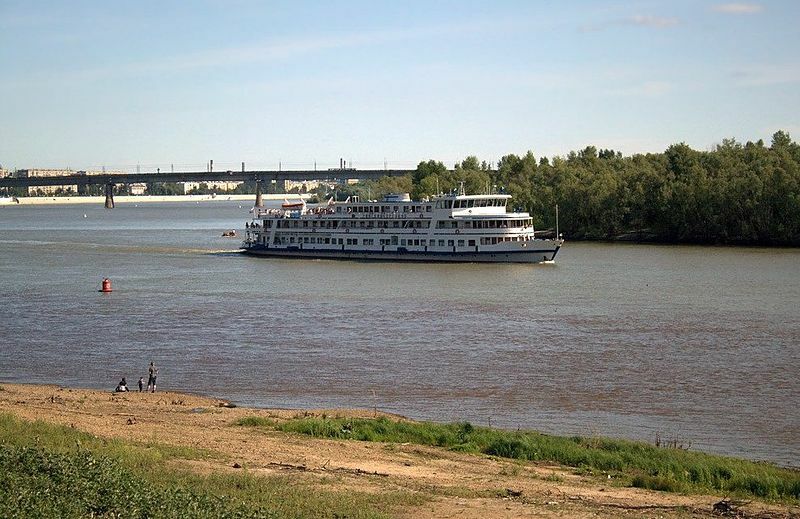 A terrible catastrophe occurred when the Bulgaria, a cruise ship on the Volga River with 208 people aboard, tipped starboard and sank. The cause is still under investigation but at least 100 are dead and 29 remain unaccounted for. The sinking happened very quickly leaving passengers and crew little time to get off before it sank. A nearby ship, the Arabella, came to the rescue of the 79 people that survived. The Russian media is all abuzz about the sinking and the terrible loss of life. Accusations are spreading fast about how old the ship was (built in 1955), how the owner was greedy and that Bulgaria’s commander had to pay for uniforms, keys, and meals. The owner, Svetlana Inyakina, has been arrested and faces up to ten years in jail. However the Bulgaria is not the only ship that was built in the last century. News reports indicates that nearly all of the cruise ships in Russia are between forty to fifty years old. Bulgaria was perhaps the oldest at sixty years. Meanwhile the Russian government has some explaining to do. Apparently most river cruise ships are in private hands and the government was minimally involved. This may explain the swift arrest of the owner in order to divert attention away from government oversight. Like Titanic, it is likely to lead to sweeping changes on the Volga and for the entire Russian river cruise ships. Some of them will be needed and welcome changes. I suspect Putin will use it as an excuse to put the ship owners under direct government control. Expect to see some public trials of ship owners in the near future. Stop the presses! An official communique, actually a press release, announces that the International Maritime Organization (IMO) has endorsed a proposal by its Secretary-General to dedicate 2012 World Maritime Day to Titanic victims. The reason, the news report says, is “that the time had come for the organisation to return to its “roots” of identifying with safety of life at sea.” Which makes one wonder how far they have strayed from their supposed mission of safety at sea. Until this press release, I never heard of IMO and I doubt many have. In case your wondering what the 2011 IMO day was, the theme was “Piracy: Orchestrating the Response.” Well the old way still works. You track down the pirates, damage or sink their crafts, hinder their ability to operate, and execute the worst of the lot and imprison the rest. For once this is a nautical related cliché. Recently a new ferry service began on the East River to reduce people taking subways and buses. NY Waterway, a subsidiary of BillyBey Ferry Co, receives a $9.1 million subsidy from New York City for a three year pilot project. When it started up in June, ridership soared to 10,900 a day. According to news reports, the city is estimating 400,000 riders for the first year. That makes it about 1,095 passengers a day. So the high numbers at the start looked promising. Business sank like the Titanic on the new East River ferry service last week once passengers had to start paying. Of course the ferry operator is not displeased. Despite the dropping ridership they claim ridership has exceeded expectations. Now usually when a business starts up and is unable to keep people coming back resulting in fewer sales, the effect is startling causing the business to correct things fast or close up. The fact traffic dropped significantly after the free trial ended means people would rather take the bus or subway rather than pay $4.00 to cross the river. Perhaps if they did not have that $9 million cushion they might look at the numbers a whole different way. What are the ten top reasons for liking Titanic? I have never really given it a thought (though Dave Letterman might). Over at AMC, Corey Abbey has given it some thought and lists the top ten reasons we cannot get enough of Titanic. 10. The Death of an Evil Billy Zane? No argument here. Zane’s character is pretty vile and knowing he ended up badly in the end is pretty good. Not sure if that is a reason but possibly a factor. Not much nostalgia though when the story is about a tragedy like Titanic. Originally, as I recall, there was not going to be song for the movie, just theme music and background vocals. Dion was called into test a possible song and voila! The rest of course is history. That is one line that now has entered the common use and will be with us for a long time. 3. Young Kate Winslet & 2. Younger Leonardo DiCaprio? It certainly made them more famous and able to demand higher fees for future movies. Not sure which has really come out better, Winslet or DiCaprio. “Yet really all Cameron was doing was returning to the days of epic romances like Gone With the Wind and Lawrence of Arabia. They ruled the box office; Titanic did, too.” No argument here. The film broke records and dvd sales went through the roof. You can view the whole list by clicking here. The BBC has images of the Titanic exhibition opening in Chatham Historic Dockyard. You can view them at http://www.bbc.co.uk/news/uk-england-kent-13980375. At a recent court hearing on the salvage matter in Virginia, images from the recent exploration were viewed. They are pretty neat to look at it. You can view them at http://www.news.com.au/technology/never-before-seen-3d-images-of-titanic-surface-in-courtroom-salvage-battle/story-e6frfro0-1226085392468.